A small section of the massive shopping complex known as Eaton Centre in Toronto, Ontario. 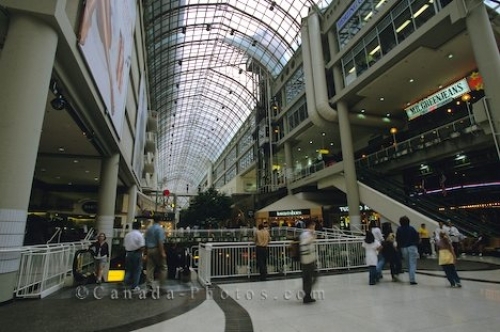 Eaton Centre is a famous landmark in Toronto, Ontario that stretches for two city blocks. Every store you can imagine is in this shopping mall where millions of people go to visit annually. Eaton Centre in Toronto, Ontario, Canada, North America. Picture of people shopping at Eaton Centre in Toronto, Ontario.